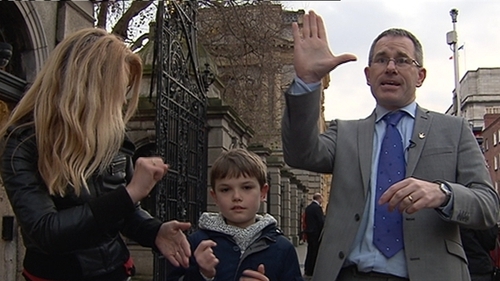 The Irish Sign Language for the Deaf Community Bill 2016 has passed all stages in the Dáil. There were cheers and TDs signed to the public gallery in the chamber as it passed. Leas-Ceann Comhairle Pat 'The Cope' Gallagher said that it was "an historic bill". The bill is set to be signed into law within days by President Michael D Higgins. Sign language is used by 5,000 members of the deaf community and thousands of others to communicate with them. Opening the debate, Minister of State Finian McGrath said he was delighted that it had been possible to achieve a consensus in the Seanad on the bill so it could now be passed by the Dáil. He said the Government's approach to amending the bill was to keep and strengthen the three key features that need to be in legislation. These are to ensure the important recognition by the State of Irish sign language (ISL) and the right of users to use it is retained, to place a duty on public bodies to provide ISL interpretation at no cost to the user when access to statutory entitlements is sought by the person, and to provide a clear statutory right to use ISL in court proceedings. Mr McGrath said he accepted the argument that sign language users suffer social isolation, which has been made by the deaf community and Senator Mark Daly, who initiated the legislation. The minister said: "Provision of supports so they can visit their GP and engage in social and cultural activities would be a humane and worthwhile initiative to combat this isolation and improve well-being and mental health." Social Democrats TD Roisin Shortall is Irish sign language was "an indigenous language in its own right used by a sizeable minority in the State". Ceann Comhairle Seán Ó Fearghail said: "It is a great privilege to be presiding on a historic day like today." Speaking on RTÉ's Morning Ireland, Senator Daly said the Bill would have a major impact and would end the extreme marginalisation of the deaf community. Mr Daly said he expected there would be a transition period of a number of years as there were not enough sign language interpreters available in Ireland. "What we are doing is making sure there is a register of interpreters available," he added. He said situations of having "not up-to-scratch interpreters" has happened in Ireland in the past and this bill will make sure there is a list of interpreters who are up to standard. He said until now many people in the deaf community have been left isolated as they have had no right of access to Government services. Meanwhile the Government has narrowly lost a vote in the Dáil on a Fianna Fáil bill aimed at tackling the rise of phoney accounts and orchestrated online campaigns on social media. Deputy James Lawless' Online Advertising and Social Media (Transparency) Bill 2017 will go to committee stage after it passed by 58 votes to 56. The bill also aimed to keep the Government's new Strategic Communications Unit in check as it has a provision that would prohibit the use of public money for political purposes. The Minister for Transport has accused Opposition TDs of "filibustering" during tonight's debate about the Road Traffic (Amendment) Bill. There were angry exchanges as Shane Ross said: "We are putting up here with a filibuster when lives are being lost as a result of this bill not coming through." Addressing the Leas Ceann Comhairle, Pat The Cope Gallager, the minister said, "I would ask you specifically not to tolerate the antics that are going on, filibustering a bill which is to save lives and then calling quorums and the leaving the house themselves." He accused Mick Wallace of giving a speech which never mentioned the bill being debated. Some rural TDs are opposed to Mr Ross's bill, which will introduce more stringent drink-driving laws. Under the bill drivers found with a blood alcohol level of between 50mg and 80mg of alcohol per 100ml of blood, will face a mandatory ban. The debate on the bill has now adjourned and the Dáil will return to it next year.